Families around the lake face many challenges: lack of clean drinking water, high costs of wood and electricity, respiratory disease, and a local economy based almost entirely on tourism. These challenges are interconnected, so addressing them requires a systems perspective. How can we improve the quality of life for people in such vulnerable conditions? 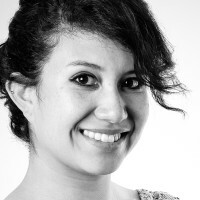 How do we design for sustainability in such a complex system? Our team focused on energy. Our initial goal was to build relationships with the local community. To identify a specific problem, we had to learn about our users. To do so, we used a framework of Observe, Ask and Try. We went from home to home, guided by our local team members, to interview people. We observed how people prepared their meals and washed their clothes. 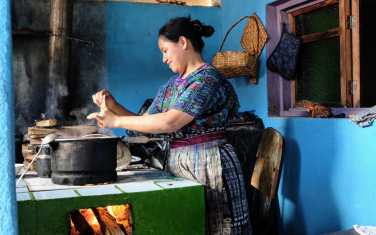 We spent hours in small kitchens learning to make tortillas and bathing in temazcals (a local form of sauna or sweat lodge used 2–3 times per week for bathing). Marta preparing food over a “traditional” plancha stove (we later learned that these stoves were only introduced into the community two decades ago). As we lived with local families, we realized that energy influences almost every element of daily life. The wood burnt in open fires or cook stoves causes respiratory diseases and eye problems. As villagers collect wood from surrounding hillsides, forests are decimated. This, in turn, can lead to destructive mudslides (a 2010 mudslide destroyed several of Santa Catarina Palopó’s homes). Families spend as much as half their income on energy; as a consequence, many families can’t keep their kids in school or visit a doctor. 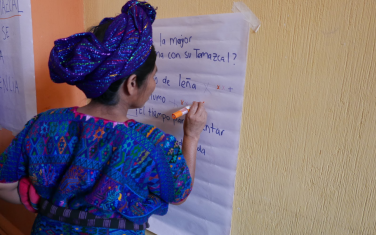 After our first week, we narrowed our focus to two problem areas: high consumption of firewood for heating the temazcals (used 2–3 times per week), and high electricity costs, largely as a consequence of incandescent lighting. Lidia using one of the first two prototypes of the temazcal burner. Most villagers heated their temazcal by building an open fire inside, on which they rested tiles and a pot of water. We built two wood burner prototypes applying the rocket stove design. We tested these prototypes with the families in Santa Catarina Palopó. 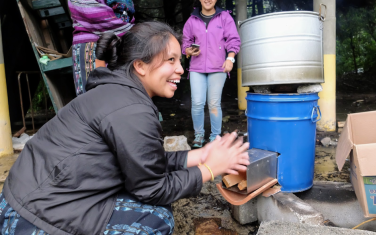 Their feedback was positive: the prototypes reduced wood consumption from 10–15 logs to just 3–4 logs of firewood while reducing smoke in the temazcal via a chimney. The prototypes are still in the pilot phase at the homes, to analyze burner performance and user adoption. Local women participate in a user session midway through the summit. A local woman indicates the biggest areas for improvement in using her temazcal. Second, by engaging our two team members from the community in every step of the process, we created advocates for our solutions. 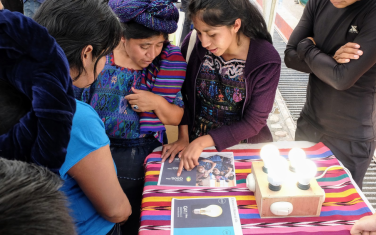 Days after we installed the first LEDs, Jessica and Lidia told many others about the opportunity to save electricity by switching light bulbs. A message from them has an impact far greater than any message coming from people outside the community. Jessica explaining the value of LEDs to women in the local market. We asked several community members — most of whom were in their late twenties or early thirties — about their dreams. Many did not have full-time work. Most expressed a strong desire to find a well-paying job so they could support their families and create a better life. We learned that one path to creating professional opportunities is through local entrepreneurship. What if young people can stay in their communities by creating new businesses? Some of the challenges facing the community are a consequence of big business. For example, Santa Catarina Palopó’s streets and lakeside are littered with plastic packaging of detergent, shampoo, and snacks; most from internationally recognized brands. This practice has two strong negative influences on the community. First, people pay (much) more money for the products than they would have if they bought in bulk. Second, buying single-use instead of bulk goods produces much more non-organic waste, which is left all around town. What would happen if big businesses would aim to do what’s best for society, rather than pursuing only short-term maximization of profits? Instead of selling single-use plastic packages, big businesses could train local entrepreneurs to sell smaller portions from a bulk container in reusable containers — much in the same way natural grocers in the United States ask people to bring their own jars to the grocery store, to fill with rice, pulses or nuts. This shift in business model would not only reduce the amount of local waste, but it would also create local economic growth, which in turn could lead to higher customer demand. Of course, the work to date is just the beginning. Impact in the community requires sustained efforts. Fortunately, three of our team members live in Guatemala. 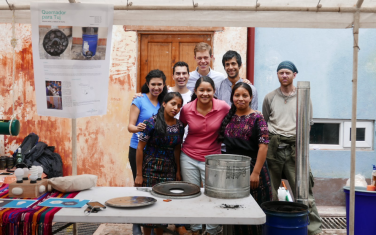 They are already planning a next visit to the community, to ask about the two prototypes, and to organize a workshop for local people to build temazcal burners using locally available, reused and low-cost materials. Thank you to the energy team who made all this possible: Mayari Pérez, Lidia Cúmes, Jessica Pérez, Andrés Viau, Daniel Connell, and Amit Gandhi. Thank you to the IDDS organizers and those who inspired us to join the event: María José Saenz, Sher Vogel, Omar Crespo, Oscar Quan, Paul Crespo and Benjamin Linder. If you’re interested in participating in a design experience like this, please keep an eye on IDIN’s website. Next year’s summits will be posted towards the end of the year.